Kings Courtyard Inn makes for a comfortable, convenient and friendly “home away from home” for exploring historic Charleston, South Carolina. The Kings Courtyard Inn in Charleston, South Carolina is one of a small collection of family-owned and operated inns and restaurants, all embraced under the Charming Inns umbrella. Its sister hotel properties include John Rutledge House, Fulton Lane Inn, and the more upscale Wentworth Mansion. One of the Historic Hotels of America, the Inn is lodged in a three-story antebellum structure built in Greek Revival Style, which first opened in about 1853. Locally known as the Blum Building, it was occupied by a series of diverse tenants until it reopened after an eight-month restoration as the Kings Courtyard Inn in 1983; it was last renovated in 1993. The building sits on Lower King Street, often known as Charleston’s Antique District, which is home to over 190 commercial businesses. During the building’s long residential and commercial history, plantation owners and merchants once slept here and it later served as Salvation Army lodging for women. We stayed in a standard double room, Room 306, on the third floor facing King Street. The room felt like it belonged in Charleston or a nearby place in the South. Although the furnishings were all reproductions of varying quality, the hardwood floors and large window frames were original. Our four-poster bed had a white-canopied top and bedspread, and sat on an oriental rug. A quaint footstool at the foot of the high bed made it easier to get on and off. Bathrooms throughout property have been renovated with modern furnishings. Ours had a Corian vanity and single sink. The unobtrusive entrance to the hotel is through a single door beside a Roberto Coin Jewelry store on Lower King Street, which is filled with fashionable shops and restaurants. The Inn is centrally located only a short walk from the historic Charleston City Market, and the scenic waterfront and promenade area called the Battery. Rows of period homes with gated gardens on quiet residential streets nearby make for a wonderful stroll. With 41 rooms and suites, the Inn has the feel of an intimate B&B as opposed to a cookie-cutter hotel. The reception staff is warm, gracious and welcoming. Public spaces include a parlor, breakfast room, two charming interior courtyards and a gracious rear yard with trees. Some rooms overlook one of the courtyards. The property is pet-friendly and has an elevator. Each evening, guests are offered complimentary wine in the Pineapple Courtyard. Later in the evening, at 6:30PM, they can enjoy a sip of Sherry, a Charleston tradition, in the parlor/lobby. A continental breakfast with freshly baked pastries is included in the daily rate and guests can even have it delivered to their rooms at no extra charge. Another personalized touch: You receive a phone call to let you know when it’s on its way. Free newspapers are delivered daily, too. Our light-filled room had a flat screen TV, stall shower, fireplace, air-conditioning and free Wi-Fi with views overlooking King Street. 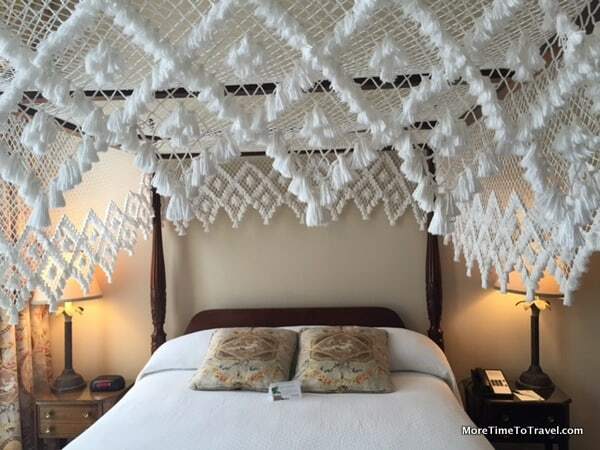 Although the style of the three-star Kings Courtyard Inn is a bit dated and tattered in spots, it makes for a comfortable, convenient and friendly “home away from home” to explore historic Charleston. Those hoping for a more luxurious setting might opt to stay at the Wentworth Mansion, the companion property that has won recent accolades from both Travel and Leisure and Condé Nast Traveler. The breakfast room can get quite busy in the morning because it is also used by guests from other Charming Inn properties. If you are in a rush, it’s best to order the room service breakfast. In addition to the complimentary Continental breakfast, other items are available at an extra charge. Because the property is pet-friendly, it’s a good option for dog owners. Charming Inns also owns nearby Kitchen 208, which is open for breakfast, lunch and weekend brunch. Guests at the Courtyard Inn receive a discount voucher for 10 percent off their meals. On-site parking is available at $12 per day. A municipal garage is available a few blocks away at the corner of King and Queen Streets. Disclosure: A portion of our visit to Charleston was sponsored by Certified Angus Beef, including our stay at Kings Courtyard Inn, but any opinions expressed in this post are our own. Hey pretty lady, looks like you’re having a great time!